Hi everyone! I'm so pleased to have you drop by today. 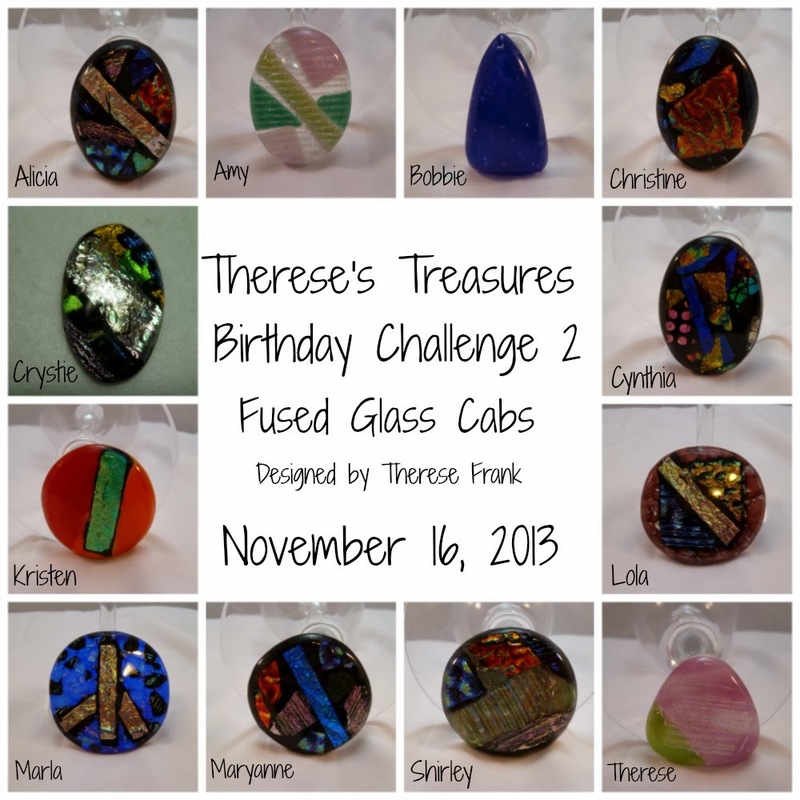 This post is very exciting for me because I have been honored as the Guest Designer on the Frilly and Funkie Challenge blog! I was chosen as the winner of the "On the Runway" challenge and that is how I became the Guest Designer for this week. I couldn't be more excited and thrilled! 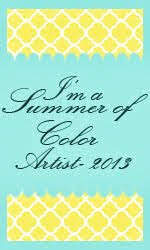 Not only was it a great honor for me but the theme for this fortnight's challenge is "Summer by the Sea"! I grew up in a small Southern New Jersey town about 30 miles from Atlantic City. We spent many lovely days at the beach and many others, in the Fall when the summer crowds were gone, walking on the Boardwalk. My memories are from the '50's when Atlantic City's Golden Age was on the wane but still lingered in the way people acted and dressed (to the nines!) when they went to "the shore". For my project I went back even further, to the real era of style and glamour that was AC in it's heyday! I created a pop-up card with all the fun of being at the shore in the summer. I love making pop-up cards. They are dimensional and can be elegant or playful, or both at the same time! Funkie Junkie Boutique last summer I ordered it right away! 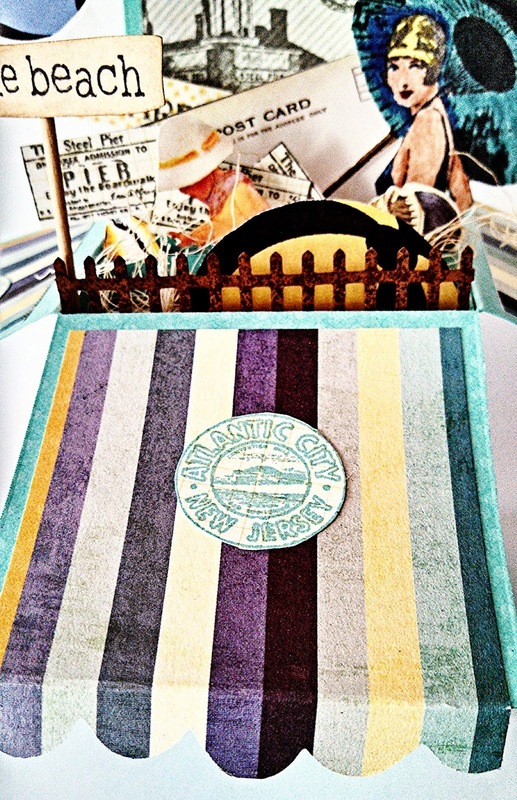 I couldn't believe that there was a stamp set depicting Atlantic City in all its vintage glory! It had the Steel Pier, with a decorative structure at the top that was long gone by my day. Some nasty hurricane probably took it away one year! This set also has Atlantic City tokens and Steel Pier tickets, bathing beauties and beach huts. It was perfect! I also used some other beach themed stamps on this project. I started with an embossed card stock and constructed the pop-up. I stamped the Steel Pier image on striped cardstock and attached it to the back of the card. 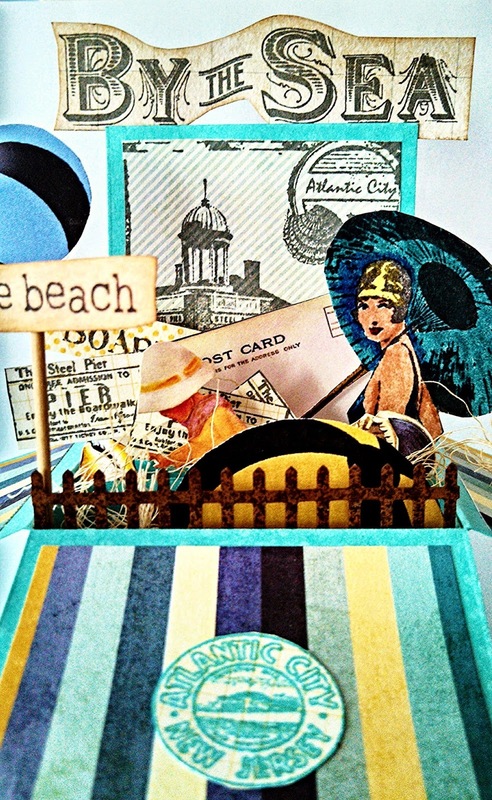 I used the new Graphic 45 stamp set to stamp the "By the Sea" sign and attached it to the top edge. 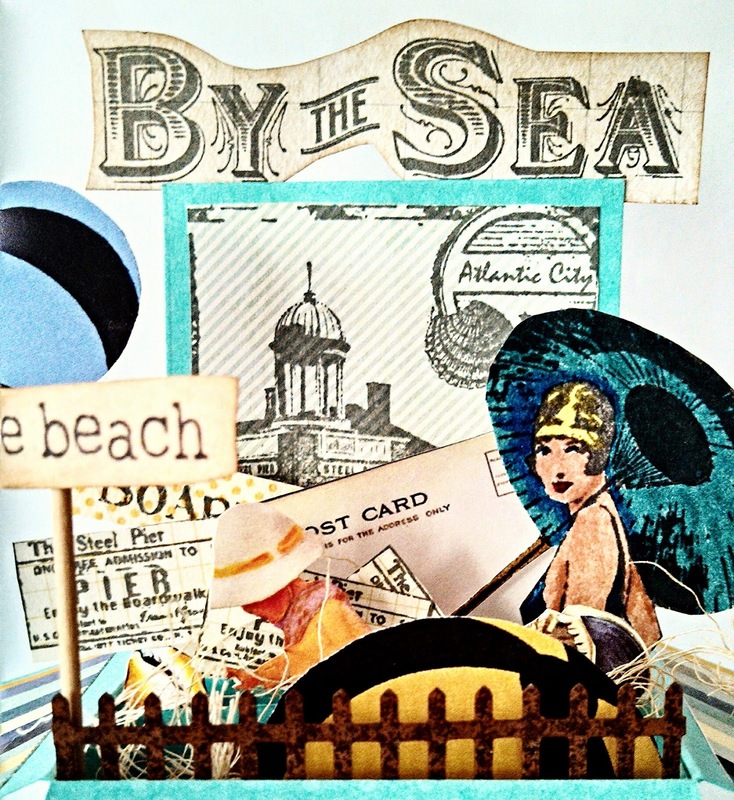 The bathing beauty was stamped with Archival ink on card stock and colored with Distress Markers. I fussy cut and attached it in front of the Steel Pier image. I added a post card stamped with Archival ink, Steel Pier tickets and a child playing in the sand. A little sign tells you that you are at the Boardwalk. There are sea shells fussy cut from a set of vintage beach images I had in the stash and tucked in. From that same set of images I cut the two beach balls. The one flying through the air is attached to a strip of acrylic packaging and the strip is glued to the inside of the card. That allows the ball to move and appear to have been just tossed in the air. There were always colorful beach balls flying though the air as families played catch with each other! Another beach ball is tucked into the front of the card. I enclosed the "scene" with a piece of rusty fencing I had in my stash and added a sign saying that you are at the beach!! For the flaps I decided to create an awning like the ones on some of the cabanas that lined the beach. I had this striped paper in my stash and the colors were perfect for this project. 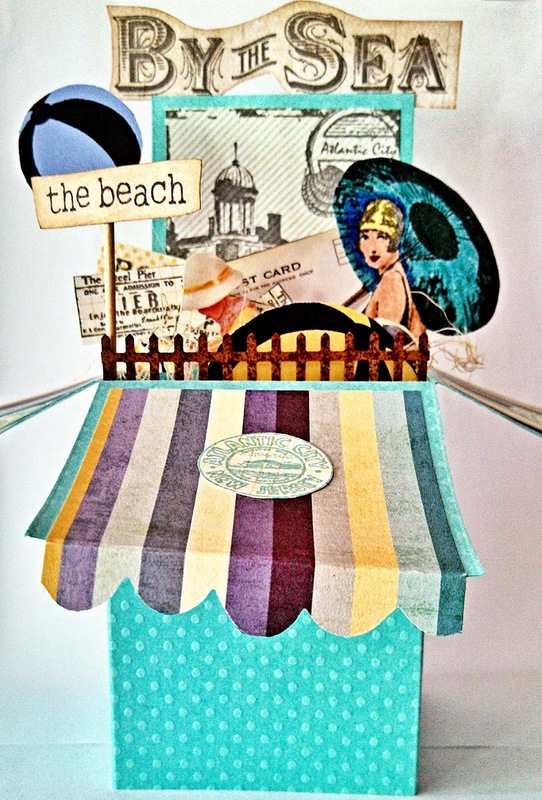 I used a scalloped die from Tim Holtz' on the edge collection and then scored and folded it to look like an awning. So there you have it! My memories of my summers by the sea! 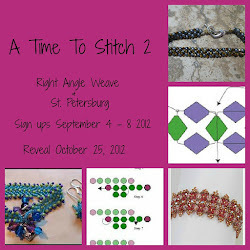 Once again I want to thank the ladies from the Frilly and Funkie blog for choosing me to be the Guest Designer for this challenge. Oh Maryanne, how wonderful!!! Both the card and the fact that you are guest designer at F & F!!! This is such a clever card I love it to bits, all those wonderful nostalgic sea side bits, - just brilliant!! I'm so delighted to have you as our guest designer this week at Frilly and Funkie, Maryanne! You have really done us proud with this beauty! 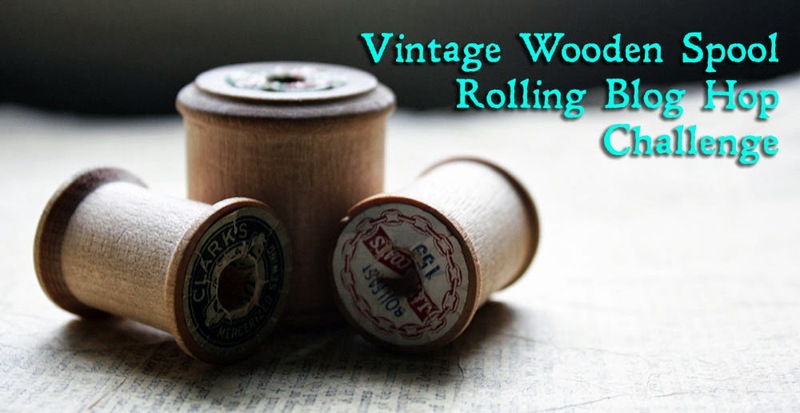 I absolutely love all the wonderful vintage images and ephemera you have included here. And that awning is just too darn cute! Thanks again for providing our visitors with such great eye candy this week. Hope you have a beachy Memorial Day weekend! This is utterly fabulous and captures perfectly the feeling of vintage bathing. Thank You so much for participating in my fun little Giveaway. Congratulation and the designing jig I know you will be great. Beautiful summer card makes me want to go to the beach, even though that is one of my least favorite places to go. It's really cold and windy over at my place at the moment but looking at your awesome summer box definitely made me feel a lot warmer! Wonderful colours and I love the good summer vibes it spreads!